Evil Dr. Maybe is trying to destroy every game factory in the world by planting his deadly penguin bombs. It’s up to Robocod to stop his evil intentions in 60+ levels of action and adventures... are you up to the challenge??? 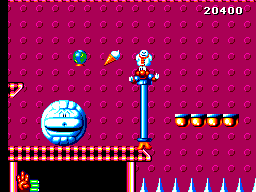 The gameplay is actually very simple; you must disarm the penguin bombs that are in the several levels of the game. Sometimes they are well hidden, but normally they are very easy to find. 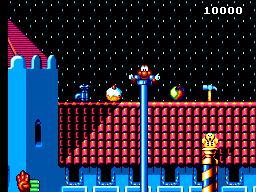 As in many platform games, you can kill your opponents by jumping on their heads, or by using the several transportation vehicles that Robocod has, like the bathtub, the plane and the car, etc. You will also have to fight some end of the level bosses, but they are all pretty easy to defeat. The graphics are outstanding for an 8-bit machine, highly detailed and coloured in a way that only the SMS was capable off. It really has that SMS feeling. The backgrounds are cool and all the characters are well defined. The game really shows that by 1993 the SMS was being explored at 110%, that year really was the Master System's pinnacle here in Portugal. As to this department, SMS´ Kryptonite, all I can say is that the sound is the usual stuff we listen to in almost every SMS game. As to the music, that’s a different department, the game has several tunes and they're all of good quality. I have to make special mention of the Christmas level, where the music is really top notch. The controls are excellent; the scrolling is a true miracle of programming. You can move James in every direction; he can run, drive, fly and take a bath that the game will never suffer animation problems. This game really shows that with talented people behind creating a game, capable of exploring the capabilities of the SMS, things went much better!! I actually finished this game several times because I just loved the Christmas level, but I have to admit that not everybody will go through 60+ levels more then once. Nevertheless, I think the game is quite addictive. 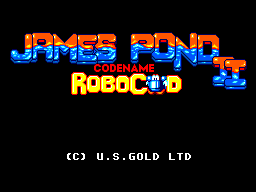 James Pond 2: Codename Robocod was one of the last SMS games released by US Gold, and I have to say that they left the Master System with quite a game. This title is without a doubt a superb port of the Genesis/Mega Drive version and enters the Top 10 SMS Platform games in my book. I recommend to everyone to try this game.